It comes as no suprise that one of the first things churches instituted was passing the collection plate. The early church was poor; it would not be until much later, when churches became entangled with the aristocratic systems, that they would hold income-producing properties and become the repositories of gold and precious stones, made into precious artwork, or generate the kind of money that would build the great cathedrals. Once local expenses were paid, the rest was stored and sent to Jerusalem, where it was used to support the Council and pay for missionaries. Paul says nothing about how much of one's income should be given to the church, but he does say that every person is to "put something aside . . . as he may prosper," that is, set aside a portion of wealth proportionate to one's income. The tithe, not mentioned in the New Testament, comes from the Jews. The first mention comes in Leviticus 27:30, "Every tithe of the land, whether of the seed of the land or of the fruit of the trees, is the Lord’s; it is holy to the Lord." Ten percent of one's income has seemed to be a universal standard for the devout. Even the least insitutionalized of the world's religions, Buddhism, will often speak of "Buddha's ten percent" and encourages giving to temples: "If beings knew, as I know, the results of giving and sharing, they would not eat without having given, nor would the stain of selfishness overcome their minds." Itivuttaka Sutra. When we feel torn, we should do what we should always do: pray diligently, for God's wisdom is available anytime we pray in honesty and humility. (James 1:5). Above all, whatever one offers should be given with pure intentions, as a service to the church of Christ and an act of submission and love of God. "Each man should give what he has decided in his heart to give, not reluctantly or under compulsion, for God loves a cheerful giver”." (2 Corinthians 9:7). 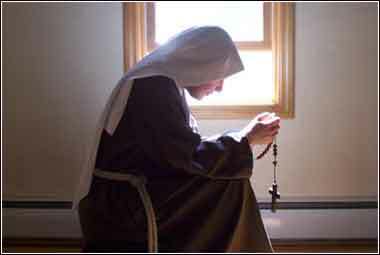 The nuns of the Catholic Order of Saint Clare are especially known for their vow of poverty.